Trading the currency markets is a complex business. With so many pairs and multiple timeframes it is almost impossible to monitor them all – but with with the Currency Heatmap you can. 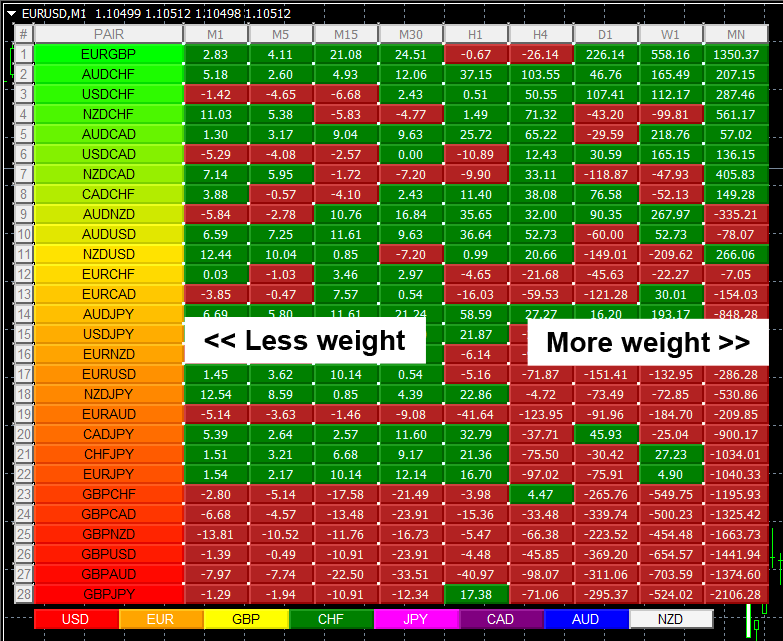 The Currency Heatmap indicator delivers the information you need to base your trading decisions on the entire spectrum of currency pairs derived from the 8 major currencies; namely the US dollar, the Euro, the British Pound, the Swiss Franc, the Japanese Yen, the Canadian Dollar, the Australian Dollar and finally the New Zealand Dollar. In one clear and simple table, you can see instantly the entire weight of market sentiment across all 28 pairs and across all timeframes. A global view of risk and sentiment on one chart. It instantly displays the “hottest” and “coldest” areas of the financial landscape. Vertically, 28 currency pairs are listed and ranked from the most bullish (top) to the most bearish pair (bottom) and reflect the data ranking on the associated currency matrix indicator. And this is where it gets interesting: horizontally, the performance scores of each currency pair are displayed in 9 timeframes namely 1 minute, 5 minutes, 15 minutes, 30 minutes, hourly, 4 hours, daily, weekly and monthly. Each cell of the Currency Heatmap indicator is color coded making it possible to interpret it instantly with just a glance, much like looking at a sophisticated thermal imagery scanner, but for Forex. If you check out the indicator, you’ll see how easy and intuitive it is, but let’s just expand on them here. Green – if the currency pair’s performance score for the aligned timeframe is POSITIVE. Red – if the currency pair’s performance score for the aligned timeframe is NEGATIVE. 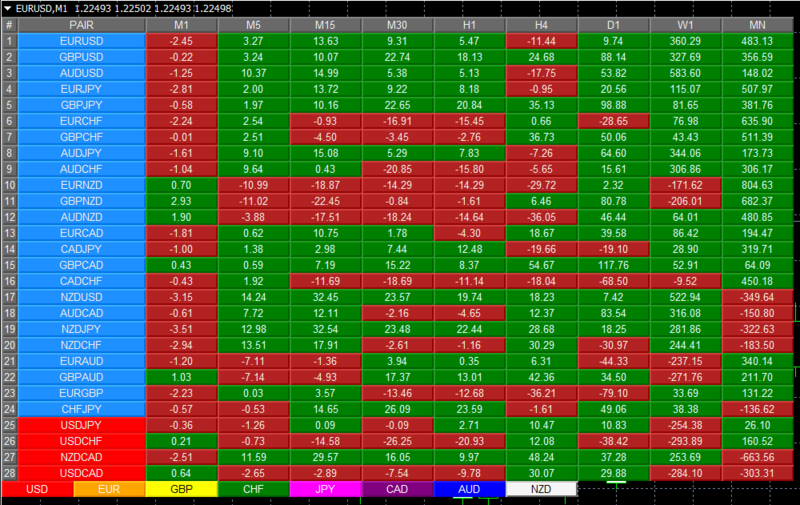 Green shades – the sum of the currency pair’s performance scores in 9 timeframes is well above the fulcrum of zero. Yellow shades – the sum of the currency pair’s performance scores in 9 timeframes is relatively flat and around the fulcrum of 0. It can either be positive or negative but trails the numbers closest to 0. Red shades – the sum of the currency pair’s performance scores in 9 timeframes is well below the fulcrum of zero. The gradation of color is dynamic and hence the transition of colors will depend entirely on the sum of the currency pair’s performance scores in 9 timeframes as explained above. 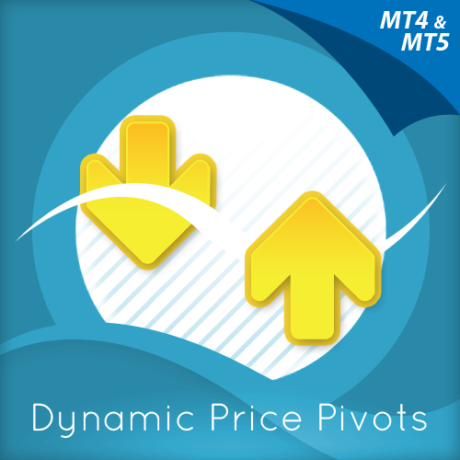 As with all our other indicators, this is dynamic and is constantly shifting in real time to reflect the ebb and flow of sentiment across the timeframes. One important factor to consider when interpreting the Currency Heatmap indicator and the ranking aspect, is the fact that the performance scores in each timeframe inherently possess weight, and this is reflected in how the indicator has been developed. As you can appreciate, the weight of sentiment in a slower timeframe is greater than that in a faster timeframe. Simply put, the weight of each timeframe is directly proportional to the timeframe itself. Faster timeframes carry less weighting to the overall ranking, whilst slower timeframes carry more. This means currency pairs ranking near or at the bottom of the ladder (bearish) are most likely to have red cells through the slower timeframes or the columns at the right hand side of the indicator. Similarly, the currency pairs at the top and ranking as bullish or very bullish, again are most likely to have green cells through the slower timeframes. 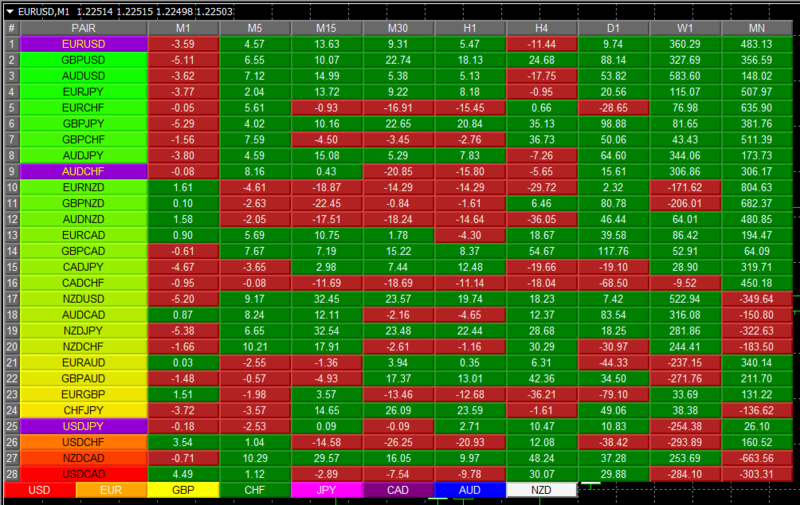 Stepping back, the changing colors deliver a heatmap reflecting the relative performance of the 28 currency pairs across ALL timeframes in real time. This gives a horizontal analysis of the currency pairs across time. Immensely powerful. And empowering you as a trader to make clear, logical and fast decisions. The Currency Heatmap indicator allows you to filter the currency pairs relevant to the currency you are analysing. Just like the Quantum Currency Matrix indicator, a set of buttons is provided below the table and displayed horizontally. The buttons work on a toggle basis. Click them once to filter, and then click again to remove the filter. 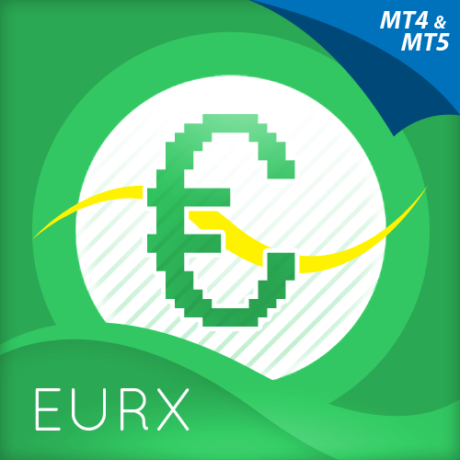 When a certain currency filter is in effect, the relevant currency pairs in the table appear in square brackets as in [EURUSD]. 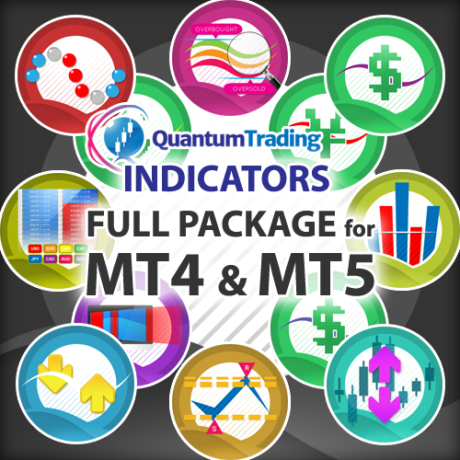 Your Quantum Currency Heatmap indicator can be applied to any chart for any currency pair. The chart does not influence or affect the appearance or performance of the indicator. For example, you can apply the indicator to a EURUSD, a GBPUSD, or a USDCHF, or any other pair. The indicator will display in an identical way on each chart AND each timeframe. The indicator occupies the chart panel itself. We recommend expanding the chart until you get a complete view of the indicator. 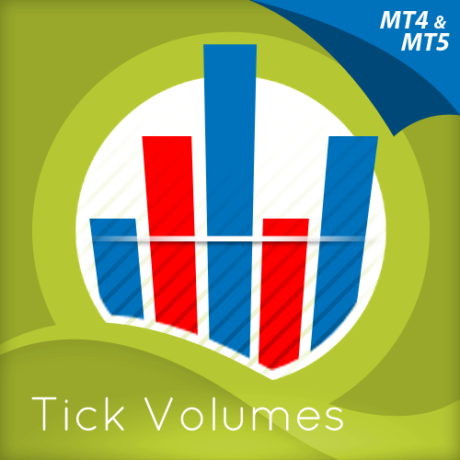 The indicator works in all MT4 timeframes. When you first apply the indicator, please allow a few seconds for the data to build in history. You may need to switch timeframes once or twice before the indicator builds in real time, once the history has been created. This should only occur on the first installation. PLEASE NOTE: many FX brokers deliver their MT4 platforms with unique currency pair notations, which vary from the standard notation as in EURUSD, USDJPY and NZDUSD. These unique currency notations can be anything from a full stop, to colon, or letters and numbers and can be either before the symbol (which we call a “prefix”) or after the currency notation (which we call a “suffix”). In either case the prefix or suffix will need to be added when configuring the indicator, otherwise it will not work. This is explained further later in the guide. To start using the indicator, you can click and drag QuantumCurrencyHeatmap from the Navigator to a chart or you can also double-click QuantumCurrencyHeatmap (which will then be applied to the currently selected chart). Doing either one of these will display the Custom Indicator window where you can configure all the various user settings for your Quantum Currency Heatmap. These options are grouped and can be accessed by selecting the tabs which will be discussed further in the following sections. Once you are done customizing the indicator’s options, click OK to run the indicator. You can configure the indicator by changing its variables listed in this tab. We explain each configurable input shortly and below are the inputs for the Quantum Currency Heatmap. The Quantum Currency Heatmap uses graphical objects instead of plot lines so this tab is empty. Let’s go back to the Inputs tab and explain how to customize the settings of your Quantum Currency Heatmap indicator. 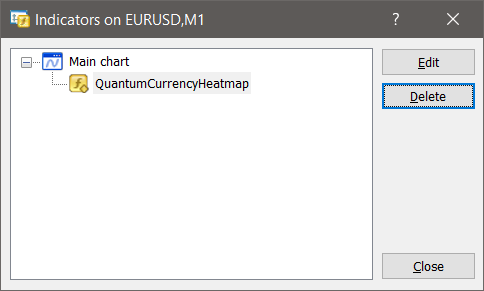 When running the Quantum Currency Heatmap for the first time in your trading account, you need to enter the email you used to register in the Quantum Trading Indicators Enablement System – http://enable.quantumtrading.com/ as part of its verification process. You only need to do this once as the email is stored in the terminal’s global variable cache after it is entered initially. Please make sure that you enter your email correctly and exactly without any extra spaces before and after it. If you made an error, simply fill this field again to update it. This is the number of bars that the indicator processes during the calculation up to the most current bar. The Quantum Currency Heatmap indicator requires a significant amount of processing power compared to most indicators, and this is the recommended setting. The higher the setting then the more processing power is required and we suggest it remains at 7, although you can change this if you wish. 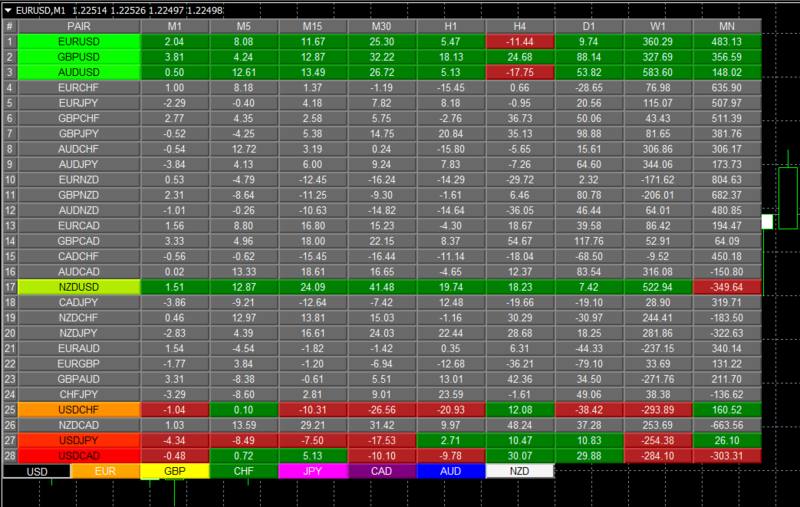 The Currency Heatmap displays its toggle buttons horizontally at the bottom of the table by default. Turning this field to true changes their position to a vertical layout at the right hand side of the table. 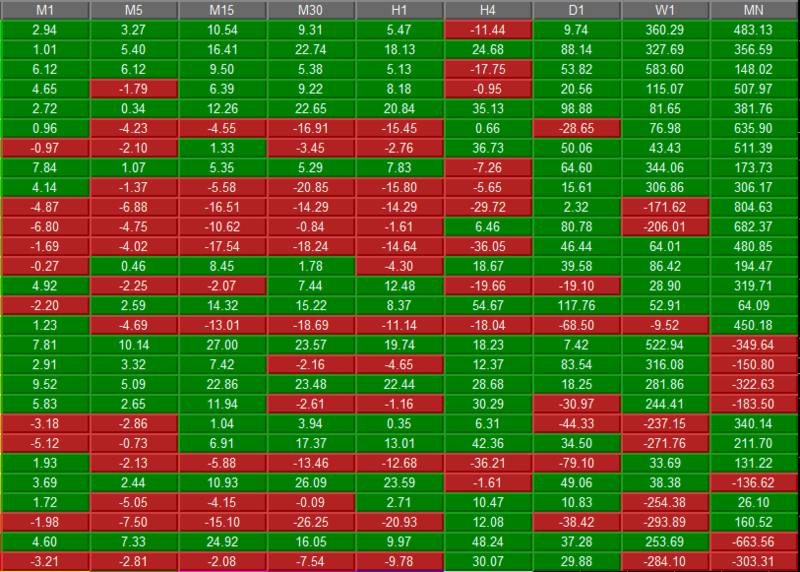 The currency buttons are the colored buttons located at the bottom of the table of the Currency Heatmap. This is used to filter out the currency pairs that contain the selected currency. Only one currency can be selected at any time. 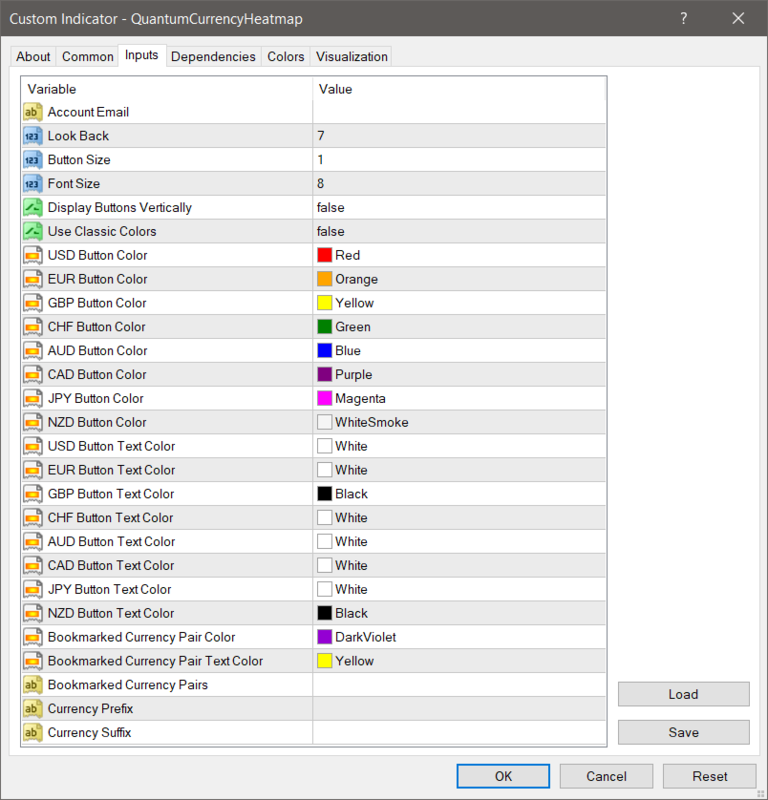 Select QuantumCurrencyHeatmap and click the Delete button then click the Close button.